← Ancient PTSD Again, and again and again. Another review for you! All about one of my favourite historical characters, Brasidas the Spartan. There is no question that Brasidas is one of the most interesting and beguiling commanders to have graced the Peloponnesian Wars. His military prowess as a fighter and as a leader epitomised the Spartan ideal, while his charm and rhetorical gifts placed him a step above his peers. So great were his achievements that he replaced Hagnon as the founder of the city of Amphipolis’ (where he died) by its citizens, and he was honoured as a semi-divine hero. While, back in Sparta a vast tomb was erected to him next to two of the greatest Spartan kings: Leonidas, the hero of Thermopylae, and Pausanias, the saviour of Greece and the victor at Plataea. Brasidas appears early within the text of Thucydides fighting in Laconia, before making a name for himself at the Spartan defeat at Pylos. He won an unforeseen military/political victory at Megara before embarking on his greatest achievement – his campaigns in the north of Greece, where he faced none other than Thucydides himself. The fact that no popular history book existed that deals with this extraordinary man means that, no matter what, Roberts has done the historical enthusiast a great service by bringing his story to life. Roberts’ approach is one of historical narrative, something he does with a great flair and obvious enthusiasm. His style is not only readable but enjoyable, and he is not afraid of using modern phrases or concepts to explain confusing elements of Thucydides’ narrative. While Roberts does not actively pursue academic discourse or debate, neither is he afraid of discussing opposing ideas and reconstructions. The only frustration being that the book is poorly referenced so one can only hope that reading all of the titles in his small bibliography might reveal a few more of his sources. The book is written chronologically, beginning with a wide ranging background chapter (chapter 1) that explores the aftermath of the Persian invasion, the Athenian expansion, and the growing tension between Athens and the Peloponnesians in particular. Chapter 2 continues the narrative into the outbreak of the war and the onset of the Athenian plague. Chapter 3 looks at the actions of the great Athenian nauarchos (admiral), Phormio, and his brilliant naval campaigns at the beginning of the war. Roberts uses this sphere of conflict to introduce Brasidas properly into the narrative, when Brasidas was sent as one of a group of advisors to the Spartan nauarchos Cnemus, but perhaps pushes him too hard as the focal person behind Spartan decision making. Chapter 4, which moves onto to the conflict around Corcyra, has a similar slant where, once again, Brasidas was sent as an advisor to the nauarchos Alcidas. Chapter 5 runs through the fighting at Pylos and Sphaktria, including the heroic actions of Brasidas; before chapter 6 brings the battle to its conclusion and introduces the second titular character, Cleon. Chapters 7-10 follow Brasidas at his peak. Starting with his political victory at Megara, chapter 8 then follows on with the start of his great campaign in the north. Chapter 9 follows Brasidas’ winter campaign, which is quite unique within the ancient Greek world and is a must read for anyone interested. But chapter 10 is the climax of the book and shares the name with the title of the book. Brasidas’ ambush, victory and ultimate death is written with a great energy that captivates its reader. The book is finished with an Epilogue that shows the aftermath of the campaign and the peace that was accorded because of it. The book itself is enjoyable, but it has its problems. Firstly, Cleon plays a very minor part; this book is almost exclusively about Brasidas, which is not a problem but makes the title misleading. Secondly the bibliography: for a book focused upon Greek warfare, Roberts does not list some of the most influential names in the field such as Krentz, van Wees, Schwartz, Sekunda, or Rawlings. For a book that is predominantly about a Spartan, it is even more concerning that there is no mention of Hodkinson or Powell, and Cartledge is reduced to just two popular history books he has written in the past 10 years. 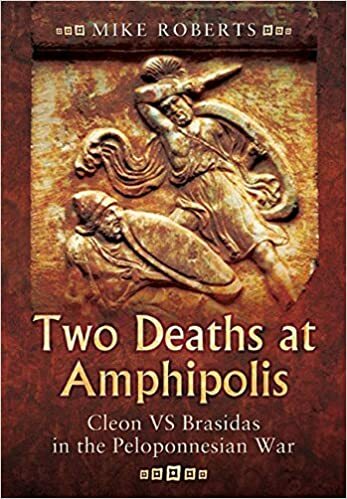 And as a book about Brasidas, it is greatly concerning to not find Wylie’s great article “Brasidas: Great Commander or Whiz-Kid?”, which at the moment stands on its own as the most in depth examination into Brasidas’ career. One wonders if this is an oversight on Robert’s part while compiling his Select Bibliography, or whether he may have benefited from this wider reading to avoid mistakes such as referring to the hoplite’s shield as a hoplon, rather than an aspis, and reciting the false etymology of the hoplite’s name (p. 15). Roberts also describes Demosthenes as persuading the Athenian soldiers to fortify Pylos, which is not true, they laughed at his idea and only decide to do it to relieve their own boredom many days later. But these criticisms should not detract from a book which is a good read, and a story well told. Hopefully Roberts’ work will inspire more people to learn about arguably one of the greatest generals that Sparta ever produced. This entry was posted in Book Reviews and tagged brasidas, military history, review, Sparta. Bookmark the permalink.